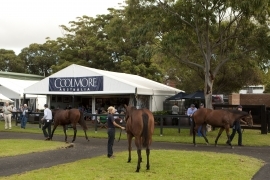 Inglis’ sales ground at Newmarket in Sydney is buzzing ahead of the start of the 2013 Inglis Australian Easter Yearling Sale tomorrow, which will feature the offering of Black Caviar’s half-brother as Lot 131. “At this time of year Newmarket is the place to be and we are excited by the great feedback received on the quality types being inspected ahead of the sale. There is plenty of hype around the Helsinge colt and it’s wonderful that people not able to get here tomorrow will be able to tune to see it sold live on free-to-air,” said Inglis Managing Director Mark Webster. Black Caviar’s yearling half-brother by Redoute’s Choice is expected to steal the show between 2:30pm and 3:30pm on Tuesday when he strides into the Inglis sales ring as Lot 131. The colt will be offered by Three Bridge’s Thoroughbreds as agent for Gilgai Farm, whose principal Rick Jamieson has been overwhelmed by the interest in the well-bred youngster. “There has been tremendous interest in the Helsinge colt which he has handled with great poise, much like his famous siblings. I’m certainly looking forward to tomorrow’s sale and am very interested in discussing the potential to retain an interest in the colt with the successful buyer,” said Jamieson. Selling begins at 11:00am on all three consecutive days of the Easter Yearling Sale, with 190 lots catalogued each day. Inglis’ Online Bidding and Make-An-Offer services will also be available this week to buyers.